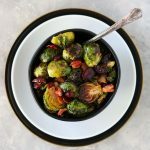 In past posts like this one for BBQ Sheet Pan Chicken or this one for Sausage & Veggies Sheet Pan Dinner I would get so frustrated because every time I typed brussel sprouts the word brussel would highlight like I was spelling it wrong. It drove me crazy! 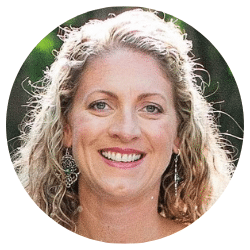 Well, while I was getting ready to write this post I was doing a little SEO homework (that is search engine optimization… which is basically the work I do to look pretty for Google) and realized that the word is actually BRUSSELS SPROUTS. What! No wonder my spell check was blowing up my posts. UGH! Well, now I know. And if you didn’t know, now you know. This is such a perfect side dish. 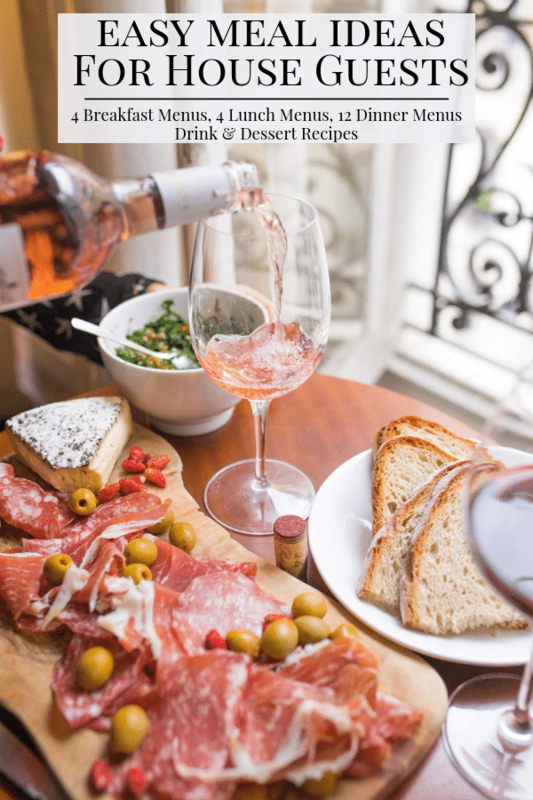 It is salty from the crispy bacon, mixed with a little sweetness from the dried cranberries. Nothing better than sweet and salty! 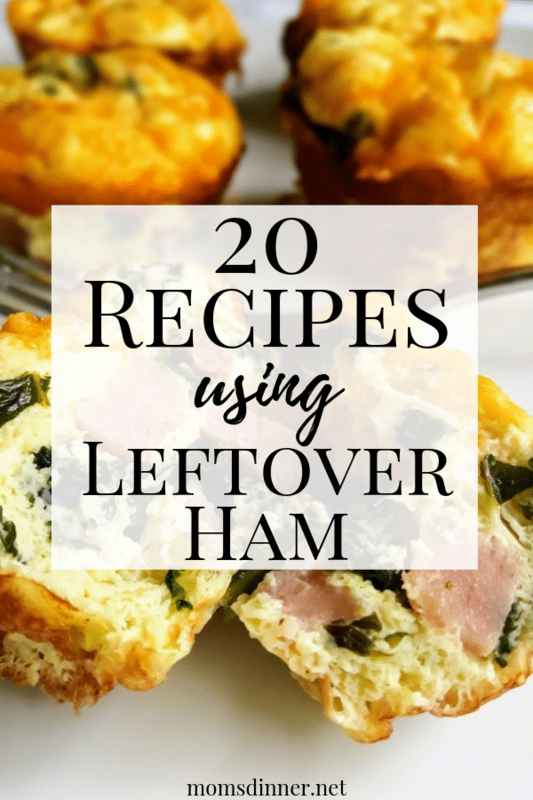 This recipe makes a great side dish with hamburgers, turkey burgers, beef roast, steaks, grilled chicken, rotisserie chicken, pork chops, pork tenderloin, or seafood. 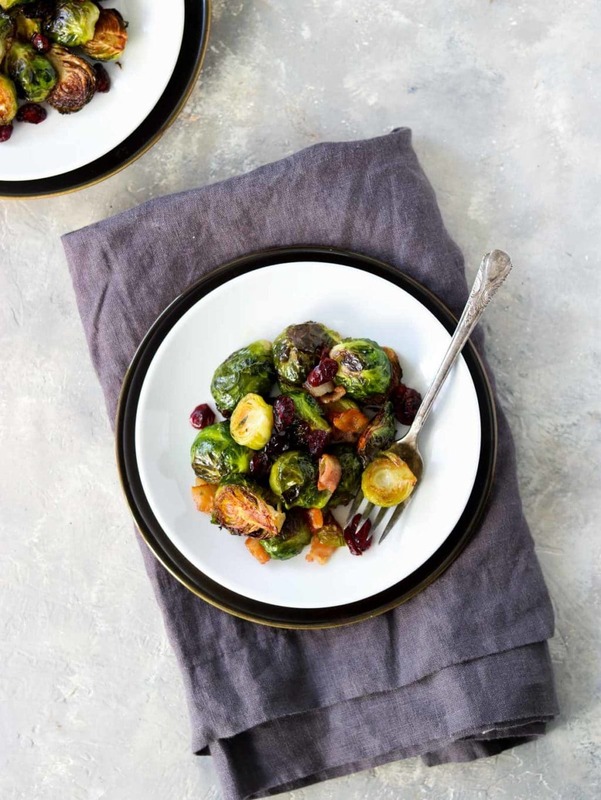 Just about any protein will match up with these Oven Roasted Brussels Sprouts. 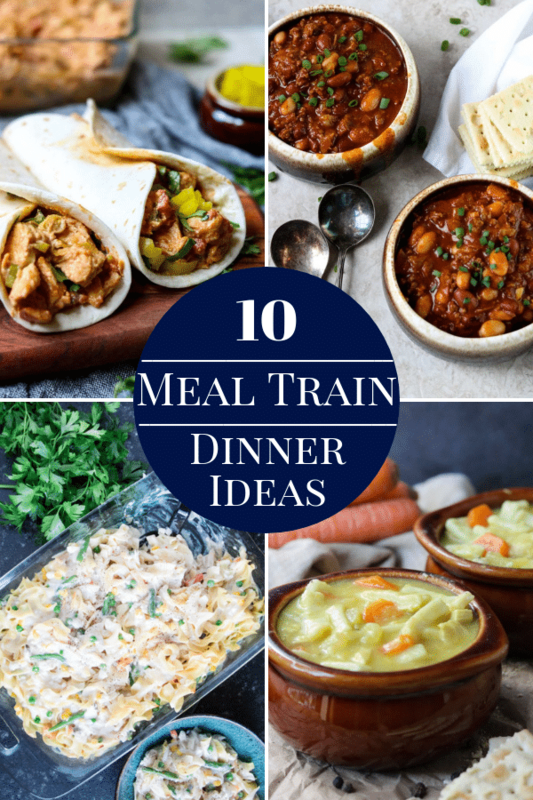 It is also a great recipe to use during the holidays when you have a lot of heavy casserole dishes on the menu and need a green vegetable, for balance. They are tasty enough to stand next to all the decadent dishes of the Holidays. Preheat your oven to 400 degrees and grab a large sheet pan. Start by washing and trimming your brussels sprouts. Trim about a 1/4 in from the stem end of the sprout. Peel away any loose outer leaves. Place the trimmed brussels sprouts, and drizzle with 1 tablespoon of olive oil. Toss with clean hands. 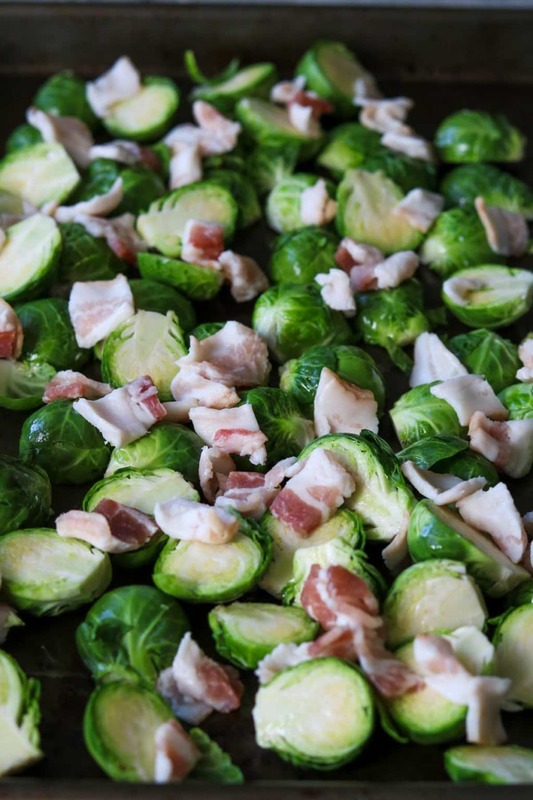 Cut the bacon into small 1/2 inch chunks and sprinkle the separated pieces over the brussels sprouts. If you put the bacon in the pan in clumps it will not get crispy. Place the pan in the preheated oven for 15 minutes. Half way thru the cooking turn the bacon and brussels sprouts with a spatula. At the end of 15 minutes add the dried cranberries and cook for an additional 5 minutes. Remove the pan from the oven and let cool for a couple minutes. 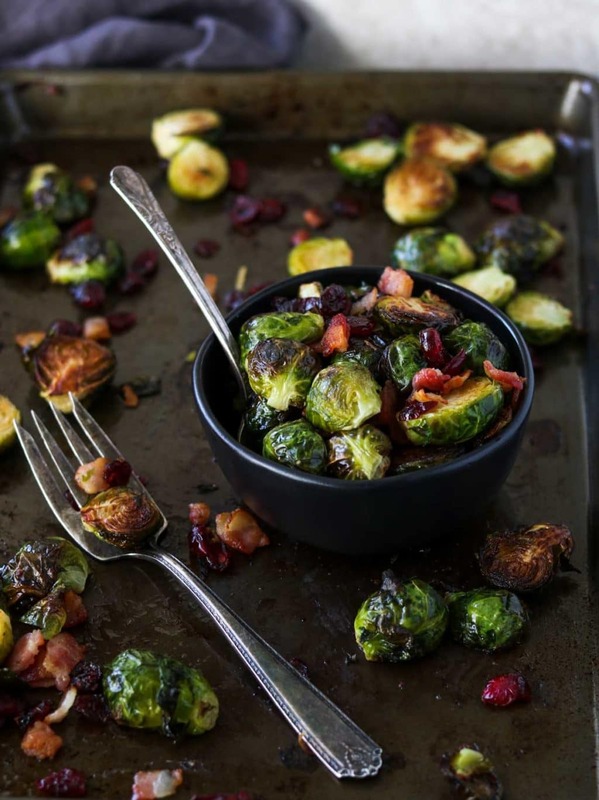 I hope you give these Roasted Brussels Sprouts with Bacon & Cranberries a try in your kitchen! 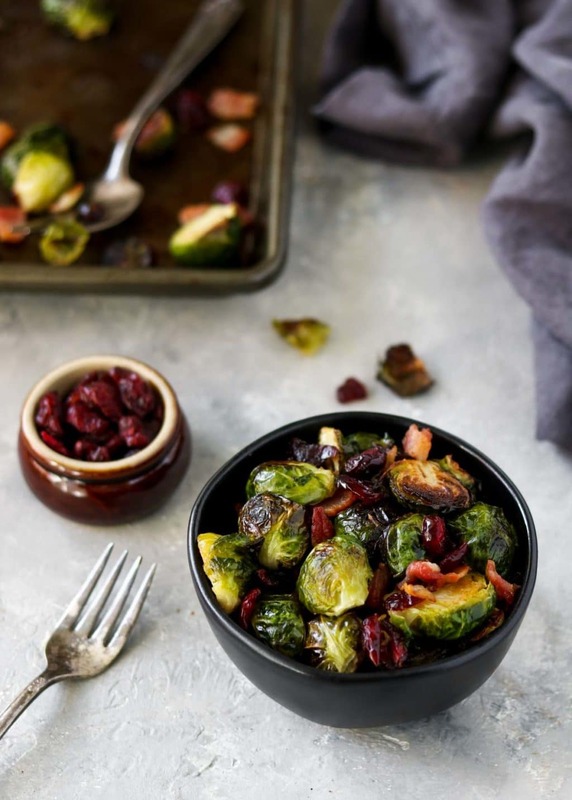 Oven Roasted Brussels Sprouts with crispy bacon and sweet dried cranberries. 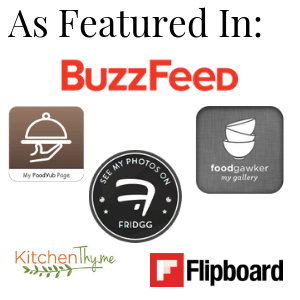 It is all cooked in the oven on one sheet pan. This is an easy side dish to make. Preheat your oven to 400 degrees, grab a large sheet pan. 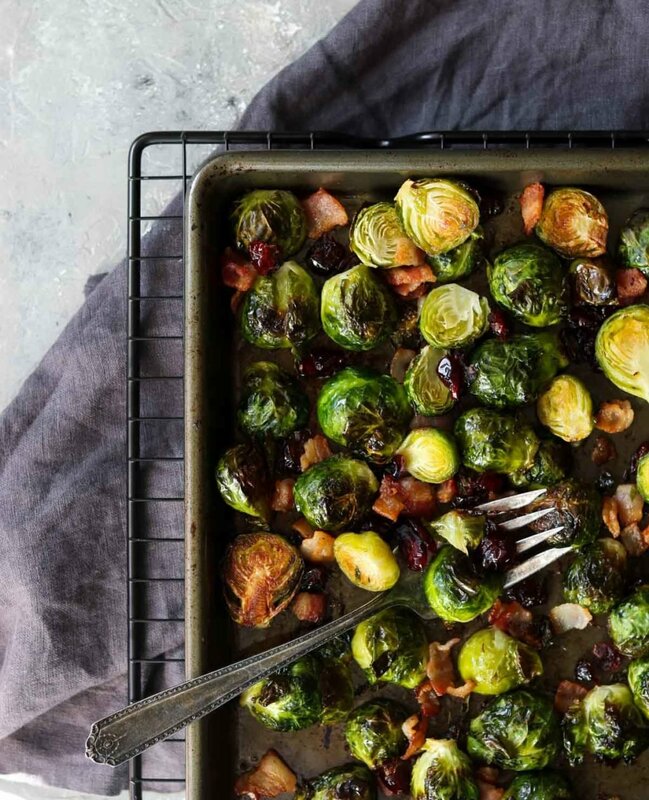 Put the brussels sprouts on the sheet pan and drizzle with the olive oil, salt, and pepper. With clean hands toss the brussels sprouts so they are coated evenly with the oil. 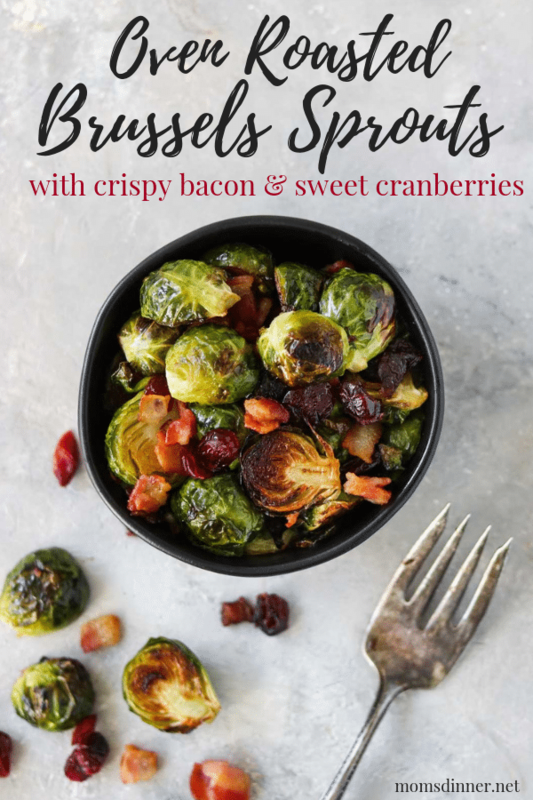 Sprinkle the bacon over top of the brussels sprouts, making sure the bacon is not in large clumps. By separating the pieces you will ensure you end up with crispy bacon. Bake for 15 minutes, flipping the brussels sprouts and bacon half way thru with a spatula. Add the cranberries and cook for an additional 5 minutes. If your bacon did not release enough grease and the brussels sprouts look a little dry you can toss everything with an additional tablespoon of olive oil or melted butter at this point. I would have never considered a Brussels sprout for any reason prior to my wife making this recipe. I get excited for them now!! Sweet and salty? Yes, please!! What an easy and yummy side dish! !